In today’s world, it’s all about having your own theme or customizing everything. You can customize your Xbox 360, your desktop, even your iPhone. 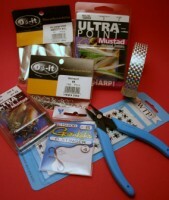 Why not customize your plain, dilapidated casting or jigging spoons. Just look at them, spoons may be the most unappealing lure anglers fish with…for real, though they hardly look realistic. Just think of how many more fish you could catch by customizing them. Why not put scale pattern decals, 3-D eyes, or a feather dressed tail on them? No doubt about it, the customized spoon will catch more fish. I heard you can bake powder painted jigs in the oven when you are done. What temperature and how long? Curing the lure will produce an extremely durable, chip resistant finish. Jigs may be "cured' by hanging them in an oven at 350 degrees F for 15 minutes. Allow a few minutes for your jigs to get up to temperature. Lures with weed guards should be cured at 250 degrees F for 25 minutes. Always open the eye of the hook with a sharp object before curing, or use an eyebuster. How much thinner do I need to add to CS Coatings Vinyl Jig & Lure Paint? Vinyl paints will appear thick when cold. THIN WITH CAUTION! First warm paint to room temperature by placing container in a warm water bath. Next, stir paint thoroughly with a wooden stir stick, being careful not to damage can lining. If paint still appears heavy, thin sparingly with appropriate thinner. lf paint is thinned too much it will lose its ability to cover.